The issue that directly follows the end of Schism. Who goes with Cyclops? Who went with Wolverine? At this point, I was already super turn as the covers of the next issues were already being teased. I already knew that Kitty and Lockheed were joining Wolverine at the Jean Grey School in the pages of Wolverine and the X-Men. 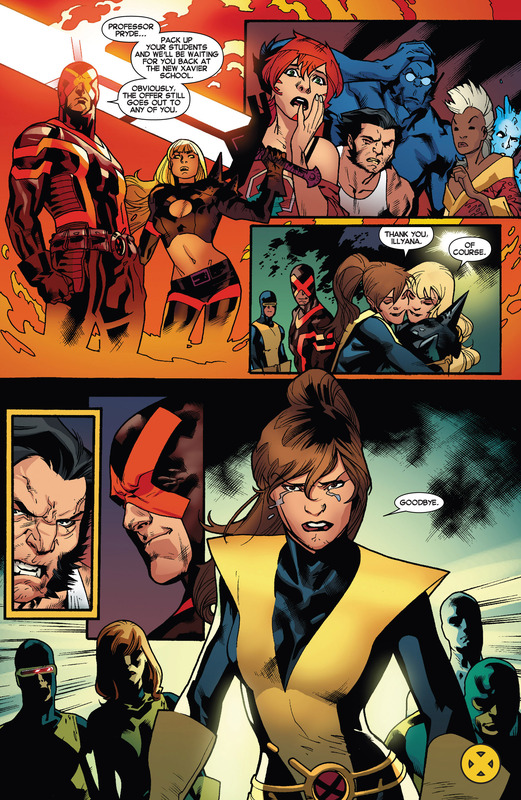 I also knew that Magik was joining Cyclops’ team in Uncanny X-Men. It was all just a fancy way of bringing back the Gold Team / Blue Team that people just love to reference of the 90s. Besides Kitty, I don’t believe there are that many others who have switched sides. Which is pretty impressive after three years. Nick Bradshaw did the covers for the Gold Side and Dale Keown did the Blue Side. Shame those are all variant covers. This is also known as the Caveman issue as that’s how the story is told. There is the conversations and then we see people as cavemen, to show how primal the story is, perhaps? Cavepeople : Cyclops and Wolverine are circling each other around a fire. Utopia, island home of the X-Men. 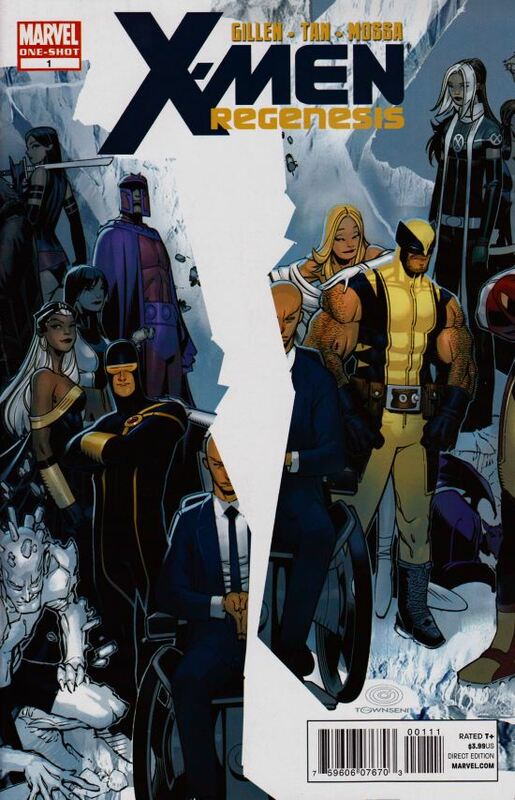 Wolverine goes to Iceman first. Bobby is honored by that. Next, Psylocke and Wolverine have a mental conversation, as they practice fight. She will remain with him in X-Force but isn’t following him to the East Coast. Which must be awkward, but I have no clue where X-Force met up at. I want to say they met in a secret cave base. Cyclops enters the room and offers Psylocke to lead his Security Team. She starts talking about being a spy for him, he doesn’t understand why she is talking about that. She is meant to be the first line of defense, not really a secret mission. Of course, we know that her thought process is that she’s going to end up telling Wolverine some hot Utopian gossip. It is important to remember that, at this time, Colossus has the power of the Juggernaut, on top of his power. It is driving him a tad mad. He doesn’t feel like he should be around children. 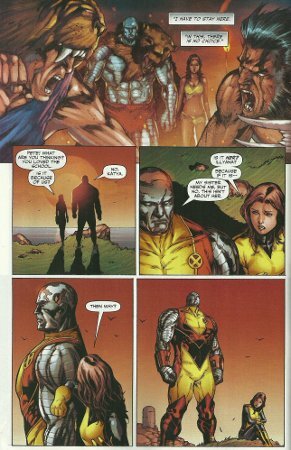 Colossus will stay on Utopia, where his sister is still being held as a prisoner / on probation. I like how Gillen sets up the Kitty / Iceman relationship. Jason Aaron must have asked him to subtly hint at that. Kitty is heading to the school to be the Headmistress. I also like how we don’t have to see the scene of Wolverine asking her to join him. Beast, maybe at Agent Brand’s apartment?, gets an email. While Brand is telling him to come back to bed, she wants more loving. I really miss Brand. Beast makes two calls. First to Wolverine accepting a position and the second to Cyclops which is essentially him continually what he has been doing to Scott for the past four years – just being a jerk. Beast finally makes it back to Brand. He updates her about his new position. 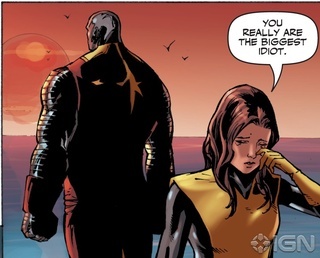 She asks if this means he isn’t going to whine about Cyclops, as much. He tells her that it will probably be the opposite. I imagine listening to complaints about Cyclops, gets old real fast. Magneto and Rogue. There is no question, Magneto is staying on Utopia as Rogue debated going to the school, but that is where she is going. I really like the trust Gillen has with Tan to . . . actually, is it Steen’s decision? 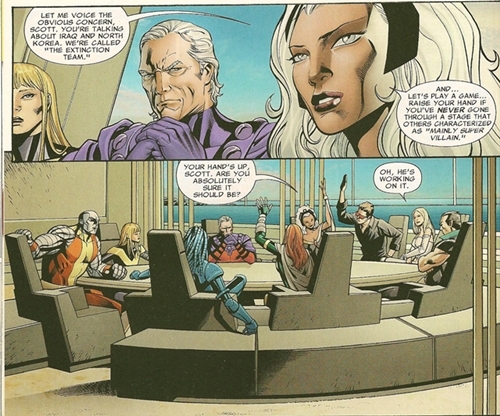 There are two silent panels, after Rogue asks if Magneto will consider leaving Utopia, where the two of them just burst out in laughter. There are no ha ha has or heh heh hehs or even a good ol’ fashion har har har. I like that we don’t have to see the laughter, they are clearly laughing. Plus, do we really want to see how Magneto’s laugh looks like? I bet its more of a, ho ho ho, situation. Wolverine, being the busy guy that he is, has made a lunch appointment with Havok and Polaris, who just got back (along with Rachel) from space where Ed Brubaker left them. The two of them don’t really want to pick a side, they just got back. Wolverine tips them to X-Factor Investigations, which is Madrox’s team. Which seems super awkward, to suggest they go join a third person’s group. Just because Havok and Polaris have X-Factor experience but no real detective experience. Cut to Generation Hope. Hope doesn’t want to lose Oya. Oya had to kill people to protect Utopia. She’s the entire reason Wolverine wants to make students and not soldiers. Transonic puts a gun to Hope’s head. Hope begins telling her about her father, Cable – not caring about the gun, at all. Afterwards, Hope accepts the decision to lose Oya. Outside, Husk is ending a conversation with her brother, Cannonball. Both of them are going to the school. Her powers are flaky and he still hasn’t come around after the events of Fall and Rise of the New Mutants. Dani Moonstar walks up to Sam as Husk walks away. She is about to sit down where Husk was sitting but Sam stops her. Husk is losing control over her powers and is literally leaving flakes where ever she goes or sits. Sam tells Dani that both Guthries are heading out East (not an expression) and this surprises Dani. Dani doesn’t want to go back to school, there are a bunch of butts that still need to be kicked. She kisses him and walks off. Cyclops is trying to recruit Dazzler. Dazzler makes a great point about how she doesn’t really feel like a solider but she doesn’t really feel like a teacher either. Which is a great point of how silly this is. Are those really the only options for X-Men, in this scenario. They could just go off on their own and be completely forgotten about in a year. Soldiers or Teachers? Frontlines or a Classroom? It just begs for a third choice. What Cyclops would like, as Dazzler is still planning to live in San Francisco, is to have a team that just protects their adopted home. So his plan is to lead the Global Team. Have Psylocke protect the island nation and have Dazzler on shore, protecting the city proper. Dazzler’s team will be more street and with a younger stand, Dazzler and the X-Kids, a title I would have considered buying over X-Treme X-Men Volume Two. Cyclops really should have came up with a better name than the one he did. He’s not the most creative fella. Meanwhile, in an awkward scene, a bunch of students are talking. Seems like they are divided, to go off and learn or to stay and live. Sure they have to get in fights from time to time but really, is Cyclops going to make any of them main team members? No, they will be off with Dazzler trying to be stars. Might as well stay. If it was up to me, I would be patiently waiting to see which X-Men made up the staff and then make my decision. I would be a total fanboy student. Hellion makes a great point, by lifting a bat with his metal hands (he lost his real ones during Second Coming, the same event where Karma lost her leg. He wouldn’t have lost his hands if he was at a school. Prodigy counters that argument with, even if you are at a school, the world won’t let you just learn. Then we get a fun two page spread of various characters expressing where they are going. I’ve included the second one for obvious reasons. Rachel is going, as she just came back from space and didn’t even know they left the school. Which is very amazing and telling of how long they were just left in space for. Shame Nightcrawler was too popular to stay in space as he would still be alive right now. Danger is staying, her job is to look over the prisoners of the X-Brig, so she has to stay where the prisoners are. Plus, she was a prisoner of the Xavier School for decades, why would she even want to go back there? Quentin Quire wants to stay but is being carted off to the school. Where Marvel will keep trying to make him happen but he will never be streets ahead. Doctor Nemesis is staying and he’s not sure why he’s even being asked as he’s busy. I love his “science stalks the night” oh if only he wasn’t given over to Cable and the X-Force after AvX. X23 states, is there any other choice? She ends up going to the Avengers Academy (everyone was starting schools back then, the Fantastic Four even had the Future Foundation). Magik makes an appearance! She’s staying but because she’s a prisoner. But even if she wasn’t, she would probably still stay. Martha Johannson continues to be voiceless. It isn’t easy being a brain in a box. The Cuckoos were split, or at least, Phoebe and Irma were. Celeste has to make the deciding vote. It was probably Irma who wanted to go, as she’s always trying to break away. Also, Celeste was the known Cuckoo at this time, so it makes sense to have her be the face of the group. Frenzy is leaving as she can’t have a relationship with Cyclops as Emma is still around, so she heads East. This was Post-Age of X.
Gambit has gotten into all the trouble he could on the West Coast, so he’s willing to go to the East Coast now. Which is silly as he was based on the East Coast for years, and barely has gotten comfortable in San Francisco. Unless he heard that Rogue was leaving and Magneto wasn’t, so he might as well stay wherever Rogue is. Avalanche, poor Avalanche, decides to stay as his bar is in San Francisco. If only he left, he would not have been around to have Red Skull take out his brain and use his body to commit murders and mass destruction. Toad really wants to leave, Wolverine doesn’t want him. Toad is even willing to be a janitor, which gives Wolverine pause. Oh Toad, if only you had a third choice as well. Scott comes to Storm and she quickly tells him to not embarrass himself. Storm’s upset over Cyclops’ decision to have X-Force be a hit squad. I’m sure she didn’t give Wolverine any grief about this once she came around to joining the school. Cyclops tells her that he needs her. Storm corrects him, that he only wants her power. Poor Scott has to make an awesome but insulting observation. 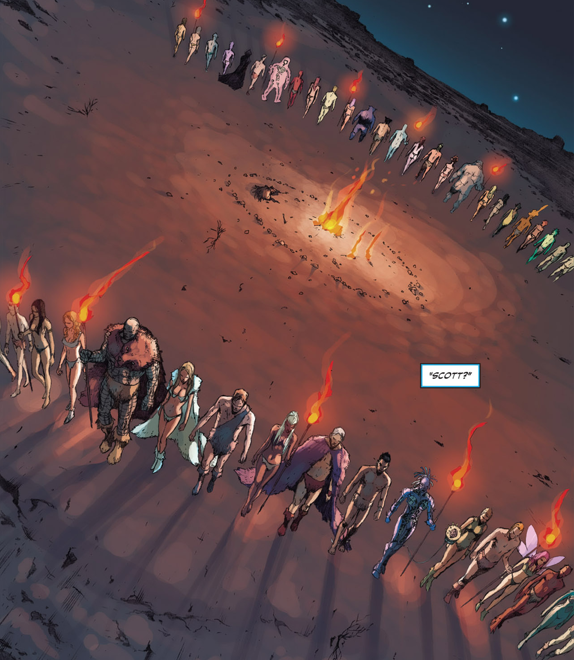 He’s align himself with Magneto, Namor, Danger, Doctor Nemesis, Emma, even Colossus and his sister – not the traditional good guy faces people assoriate the X-Men with. In fact, almost all of them are known for being villains. Colossus is heading that way and Magik was always on that fun line of being a bad girl surrounded by good teenagers. He wants, no needs Storm to be on his side to balance that. There is an awesome image from Gillen’s first issue of Uncanny X-Men Volume Two, where Storm asks who hasn’t been known to be a villain. Cyclops raises his hands and Storm asks if he should be. Emma states that Scott is working on his villain turn. At the time, it was awesome but now I feel like Marvel has been trying to cast him in the role for a while. I forgot that Hope raises her hand as well, so cute! I also like how casual the others are about not having their hands raised. There is no shame in that room. Nor should there be. I can completely understand Cyclops’ side of the issue. 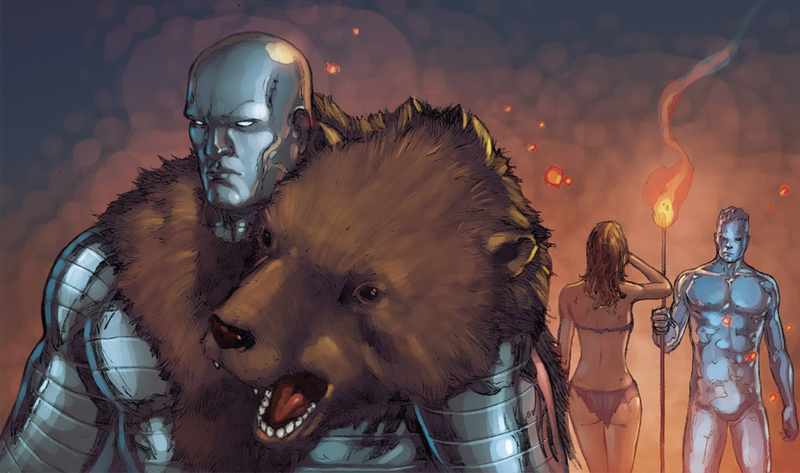 Especially after he mentions who Wolverine was able to get on his side – Beast, Kitty and Iceman. I mean, Beast and Iceman are pretty lousy but Kitty is pretty much a steal for whichever side. Since, when Kitty joins Cyclops’ side, that smirk on his face, so awesome. 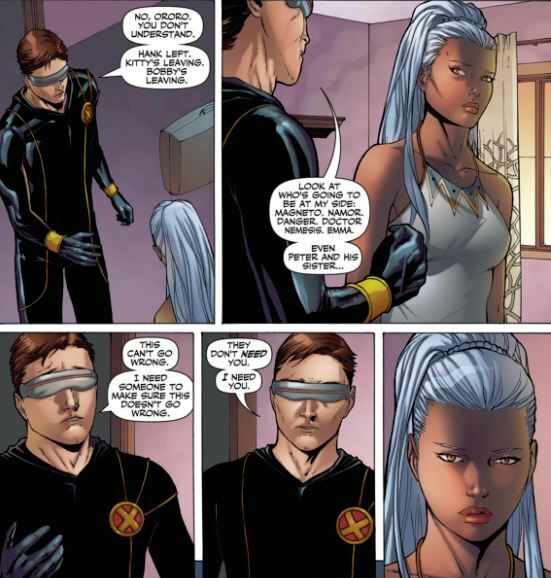 Cyclops tells Storm that Wolverine doesn’t need her, Cyclops needs her. Such a real and honest moment. Cyclops finally gets around to talking to Emma. Emma is insulted that he just took for granted that she was going to join him. She loves teaching, she would be a perfect fit over at the new school. Cyclops tries to tell her that they teach at the island. Emma corrects him that they mostly train here. Cyclops gets a whiff of Emma maybe leaving him and the island and starts preparing to grovel. She can tell that’s where he is heading and tells him to stop. Emma, for some fans out there I suppose, reveals that Warren is gone and so Utopia needs some funding. She sold most of her holdings, so she can fund their efforts for quite some time. She just hopes that they don’t crash too many X-Jets. Some fans worry about where all the money comes from. I mean, after the X-Mansion was destroyed the third time, how rich could Xavier really be after those rebuilds? Scott owes Emna many back rubs. So the sides are shown as the cavefolk. I sort of wish that the two sides were switched so it was Wolverine’s side coming toward us, the reader. Not sure how they picked the order to list them.